Call me facetious but I've never had a good coffee on the gold coast - although I'm sure that they must exist! Can anyone enlighten me? Hi, If you had time to visit just one cafe on the Gold Coast then it would have to be Piccolo Espresso at Mermaid Beach. If a successful cafe reflects its location then this surely does. The vibrant crowd here enjoy Merlo coffee at its best, great beach location and interesting food. The owner's past experience at iconic cafes Little Bean and Three Beans shows here and they keep improving. Contrast this with the twice failed Gabrielles Couture Cafe at Riverwalk on the Gold Coast. Set up (e.g. starched tablecloths ) to reflect a promised boutique- style upmarket precinct which was not really delivered and not even Creative Coffee and an award winning Barista could save them. I suppose that I have visited most cafes now on the Coast and in many of the towns as far south as Ballina and another which ticks all of the boxes (with coffee the most important) is Evolution Espresso (Toby's Estate) on the river at Ballina. The river is the CBD Ballina and the cafe is a perfect fit. Hi, a colleague has reminded me that if you want the best coffee/cafe experience then it would be Piccolo, but if it's the coffee then the Synesso/Mazzer/Own roast combo at Liquid Espresso at Eastside Robina is best particularly after 11 am when Nicki steps up to the machine. My fav so far is the Merlo shop in the Ferry Road Markets at the Brickworks in Southport. Try the 'private' blend sometime if you like a smooth taste. For great atmosphere and good coffee - try Cafe Bellago at Emerald Lakes off Birmingham Rd. Carrara. So far it's been consistent for me! Call me facetious but I've never had a good coffee on the gold coast - although I'm sure that they must exist! Hi Redwood and Captain Buckets, I was recently at the Merlo Roasting House at Ferry Road Markets and they have lost their best barista (Reyne) so not their usual high standard. I also tried Bumbles(Merlo) at Budd's Beach while out there and it was reasonably good. Have tried Bellago's(DiBella) as well and liked that Dulce Sappore blend. I found CBuckets impression of the Deck at Currumbin to be interesting as the barista (owner??) can really "nail" a Merlo on her day. Have also tried Le Monde but I can make a pretty good Vittoria on my home machine. Will check out Little Lido and let you know. At Easter, with the usual good spots closed for the holiday and Ferry Road off the boil I went to Niche (Merlo) and enjoyed the experience. Look, if you like a Merlo and will travel to central GC, then try these 3, all within a minute of each other! Piccolo( Mermaid Beach,Wega/Mazzer combo).....one of my top 10 Australian cafe experiences. 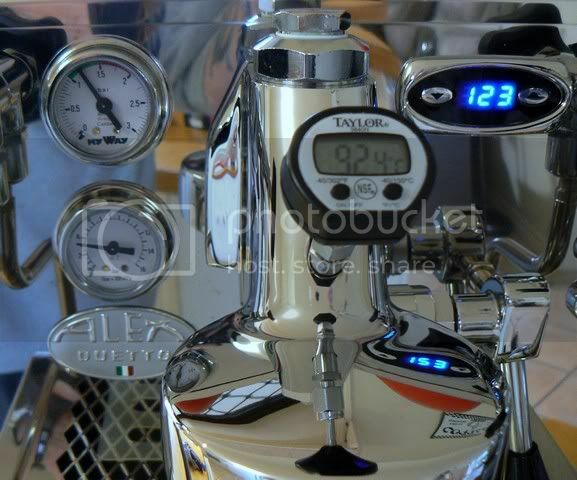 Vintage Espresso( Alfred St. Wega/Mazzer combo) . Retro 50's furniture, mirrors and Chandelliers....the little lady will be impressed! Niche (Dawn Ave, Wega/Saeco combo) A budget fit-out and a barista who finishes every sentence with an aaaay, but he is good. Also, expect a crowd, as these places are popular with the locals and well patronised by GC sports celebs.....e.g. I even saw Nathan Corbett (Google him) on my only visit to Niche!......just don't get into an argument with him over coffee! Sorry, but my better half advises me that Piccolo espresso is at Miami Beach(attached to SLSC) and not Mermaid. Didn't know there were any good cafes on the Gold Coast - thanks for this; am going up there shortly - can't wait to try these out! just finished up a six day training intensive in Broadbeach on the Gold Coast and I found Coffee Sisters, located in the Oasis shopping complex to be very, very good! Both my piccolo and espresso coffees featured a distinctive 'ripe berry' aroma which also translated nicely to the palate, and the food is good too! Also had a few coffees from 3 Beans on the main drag, which were made well, and pretty good - except I think that their antiquaited coffee equipment lets them down a bit as 'wet' steam translates to uneven milk texturing, which does not hold the body of the coffee as well as it could - still, the staff are uber firendly, and the joint is open 24hrs - which is flippin amazing! Hey Askthecoffeeguy, Coffee Sisters at Broadbeach is a good choice if you don't have wheels, particularly if Brianna is on the machine. Ditto at Coffee Sisters on Rio Vista with barista Shardie. By the way, what is protocol if your preferred barista is taking a stint at orders or waitressing (waiting)?? I always make a point of thanking the barista if I liked the coffee so that sometimes when I arrive and that barista is off the machine, they will hop back on for my coffee. Otherwise, I may try something like this.....e.g. on Saturday( after travelling 15 minutes), my preferred barista was taking orders so I lied "I haven't had a decent coffee for a week". To which she replied "Is that so". Then I say "Not since the last coffee you made me". It worked! Have you guys got any other ploys that work? Mate I find out and out flattery is the best thing for getting results! Otherwise I'm selfish enough with my coffee's to say that I'll have one but only of so-and-so make one for me! Hi, went to Piccolo on Saturday morning.....is there a better cafe on the Gold Coast for that '6.30am vibe' ? It changed hands today, Robbie McEwan (Tour de France cyclist ) is the new owner. Noticed some new staff so hope that nothing will change. Big question is where will ex-owner Paul turn up next? Odds are that the G.C. will have another iconic cafe sometime down the track. Then down to James St Burleigh to check out the new Quest Coffee Roasters. Liked the LaMarzocco (a 70 ) and the choice of roasts. Also spied one of the Liquid Espresso baristas Nikk O( she finishes a flat white with a sheen like polished marble!!!) checking out the scene so will be interested in her view. I recommend this place to "coffee nomads". Coffee Club, the usual SanMarino/Mazzer combo. My barista was Paul Bassett trained. Gloria Jeans, usual G. J. 's with Border's books to browse. Vida Espresso, (Mokador) an experienced barista who loves his Expobar machine. Shingle Inn, a machine with no brand! Bean and Beyond, fit-out not complete but while there's life,there's hope! hey jm - thanks for your comprehensive wrap up of GC coffee - I must say that my expectations were not high while I was there recently, but I was pleasantly surprised by stores that are making a good go of it, with Coffee Sisters my out and out favourite. Didn't get to visit many places but I thought that the Illy franchise in the mall (a round the corner from the coach stop) - made a pretty decent and very drinkable latte for grab-and-go, all the more so considering the coffee is, how shall I say this, not freshly roasted? Hi, heard a rumour that the 5th new outlet at the $300 million refurbished Robina Town Centre is Coffee Club's new upmarket franchise "First Avenue". Sensing a 'scoop', I slipped through the hoarding of the soon to be completed fitout and, wandered around inside. Spied a gleaming new Wega with Mazzer and just for a moment I could taste a Toby's Estate or a Merlo (these go nicely with a Wega), but this was not to be. Indications are that they will be using piazza d'Oro. New outlet no.6, Bean and Beyond I estimate is about a week away...interesting fitout. Dropped in again to Quest Coffee Roasters at Burleigh. Tried the Costa Rican blend but after a good start it just "died in the cup" (feel free to use this phrase!). I preferred last weeks Guatemalen. Central Gold Coasters, don't forget free coffee at Vintage Espresso's birthday next Tuesday (26 May). Hi, I tried the new outlet "First Avenue" at RTC last weekend. Great fitout/outlook and interesting food. The coffee presented well (as it should with that Wega) but I had some reservations and discussed these with the manager. I am interested in other opinions. New outlet (no. 6?) , Bean and Beyond opens there tomorrow (Tues26) with Merlo/Boema. Here's hoping! coffeejourneyman, funny you should mention nathan corbett he now regulars at Vintage Espresso in mermaid. my other half's sister is dating him and has been for a couple years now, he's a very fussy coffee drinker might i add. Vintage is probably my favourite spot at the moment, reminds me of melbourne with the retro/vintage furniture. coffee is lovely, i do personally like merlo though. my ristretto's are always in a cute little cup and have always been awesome. their food is great too, lot's of homemade cheescakes and small slices. they accomodate for the gluten intolerant also i might add. Niche is nice aswell, had many lovely machiatto's there, very small though and their opening hours are limited. 3 beans in broadbeach isnt bad, but lack of attention to detail and some staff who didnt speak with as much warmth as the ambience suggests was a but dissapointing. again lots of nice little delights such as bliss balls (rum balls), as well as a range of interesting tea's. it's a nice spot to sit and watch people pass by, one of those places you stick round for a while in. i'd like to hear an outside opinion of Zarraffa's if anyone's willing? Hi, this week has seen three more coffee outlets open at the huge RTC complex. "Bean and Beyond" started out with a Boema on Tuesday, by Wednesday it had been replaced with a SanMarino and then on Saturday a Wega appeared. Tried a coffee there on the weekend but it came out way too hot and before I realised it , I had shredded my hard palate.....my fault entirely....the last time I was shredded was back in 1994 and that was over 10000 coffees ago! The new cinema complex opened on the weekend with two licensed cafes so now there are four cafes within 50 metres who use Piazza d'Oro! Nathan 'Carnage' Corbett and I have a few things in common. We both like DiBella and Merlo coffee when in S.E.Qld and the same cafes. Unfortunately in each of these cafes we have the same favourite seat and he's always lounging around in my seat when I get there! Oh well, I hear he's going overseas soon chasing his 6th world title so I'll be able to mind his seats while he's away! Cheers, Journeyman. I don't think I would like to be jostling with Nathan for seating space - he could accidentally put your eye out! Toscani's....Brasilia/Monte combo.....An experienced barista and plenty of customers. Groove Train.....another LaMarzocco/Veneziano and the trainer is Veneziano's own J.P! I thought I'd seen him somewhere and it's only just occured to me....Boardwalk Bar and Bistro in Brisbane and that was some time ago! Rumour is that he'll be there this Thursday, so well worth a visit. Hi All. I (We, SWMBO & I) found Little Lido at Coolie the best. Discovered LL whilst on the coast in Sept last year. When we went back up there (from Melbourne) in May, this year, we stayed at Sufferers Paradise and would drive the 1/2 hour odd to get (IMHO) the best coffee on the coast. The food is pretty good too. Juanita ( ? I think that is the owners/ managers name) did not bat an eyelid when I asked for 7 shots in my capp. The rubbish at Sufferers was like that detergentized phosphoric acid replacement stabuck or inglorious genes offers. Hi, I finally got to Coolangatta to check the coffee scene, especially Little Lido. I chose 11am/11.30am as I've found this is a good time to find where the serious coffee drinkers go. There are many coffee outlets in this precinct....most specialising in food e.g. bakeries, fast food etc. and the cafes which are more coffee oriented than food were either empty or had few customers at this hour......except Little Lido which had nearly 20 seated and a few at the counter. The coffee is Gusto, from Sydney I'm told and they have the Wega/ Mazzer combo which I'm partial to. The barista is Julie as mentioned above and she's obviously read the Scotty Callaghan creed....presentation is everything....should have taken my camera! Well that's it then for unless I've missed something, LL is the pick on the southern end of the Gold Coast. One thing though, since Piccolo Espresso at Miami has the same machine etc. as LL why not do as I did and try a coffee at both on your next outing but I'd give my vote to PE. Lately, I've been keeping an eye on a row of recently completed shops in Scottsdale Ave Robina opposite the Easy-T. Most are up for lease and I finally spied what looked like a cafe about to open up....fitout happening and a sign Taxpresso appeared....time to check it out! Unfortunately, I should have paid more attention to the 'x' in Taxpresso rather than the 'o'. No coffee here. Finally, I have been able to try all coffee outlets in the giant Robina Town Centre complex when a free Donut King Royal Bean coffee voucher arrived in my letterbox. Now normally, I wouldn't like to be spotted having a coffee there but a freebie is a freebie. A nice flavour though and I'm wondering about the story behind Royal Bean as I'd like to run some through my home machinery. Even better, here's an interesting thought for shoppers at RTC. What about Donut King's Royal Beans through Groove Train's LaMarzocco with Coffee Club's Paul Bassett trained barista Ellie? Hi cjm - as with Pacific Coast, you seem reluctant to 'put your thoughts on the line' - I know Gold Coast is a large area, but can you say which one is the best so far?